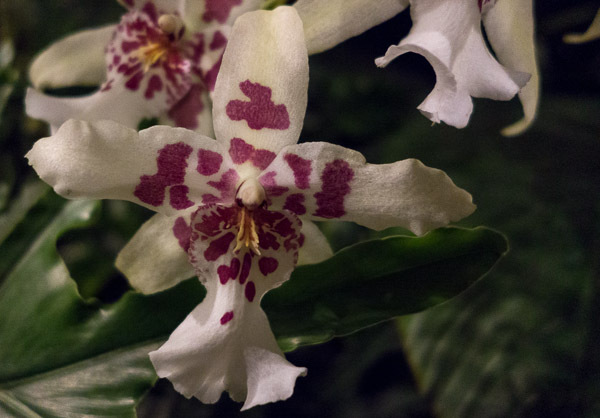 The Orchid Show at the Missouri Botanical Garden opens today! We went to a premier the other night. The Madagascar theme is done well with interesting signs and intriguing displays of how plant material is used. The water features are lovely. And, of course, the orchids are beautiful. Rick took this with his new high-end small camera (Sony Cyber-shot). This is the camera he intends to take to France since lugging around our SLRs doesn’t seem like much fun but having a good camera in Paris seems like a lot of fun. See more photography around the web at Saturday Snapshot – February 2, hosted by Alyce of At Home With Books. They are such lovely flowers. Great shot. Beautiful. My mother grows orchids and her cacti bloom. Enjoy your trip, Joy. Love love love orchids! I am always amazed at how many varieties there are! Bet the orchid show was a real education! Looks like you’ve got a good camera for your trip. I’m hoping you’ll take some pictures of doors and post them here. J’adore heavy, old French doors. I love flowers and Orchids are the most lovely, showy and intriguing ones. Thanks for sharing a beautiful shot. Beautiful. How nice to be in a room full of flowers. I’m counting the days until the Chicago Garden Show in March. The size of our good camera is certainly a drawback for travel. I’ve debated taking it along on trips, but it’s just not practical. I do like the small camera we have though, so it’s not a huge problem. 🙂 That flower is beautiful! Beautiful!! My mom had 10 green thumbs, sadly I don’t even have one, so I love seeing other people’s photos of flowers! How beautiful, Joy! I love the colors. Matches the colors of your blog! Have a great weekend! Lovely flowers, and they look like they were designed to fit in with the colours of your blog. I have been musing over the idea of growing orchids, or rather it might be struggling to keep them alive.not too long ago I read and reviewed a cosy mystery that centred around orchids. only whet my appetite for more. that is a lovely photo. These orchids are beautiful. I don’t have much luck growing them though. Orchids are so pretty. I had a client give me a lovely arrangement.